I love looking at old photographs. I recently bought a lot of 125 pictures from the WWI era. 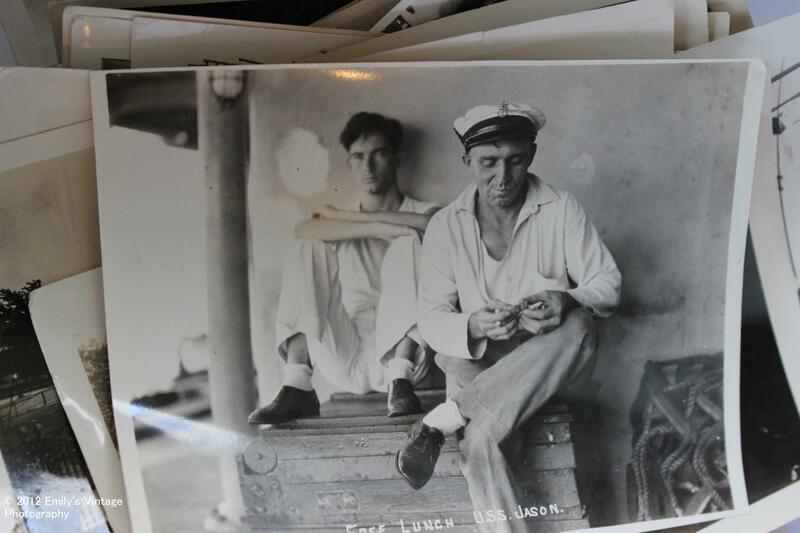 This photo is one of Navy men aboard the U.S.S. Jason. I don’t know these people and they aren’t related to me (As far as I know anyway). I just find looking at photos from the past to be interesting. I love studying what they wore, their environments, and all their quirks. I often find myself wondering, Who were they? What were they like? What were their dreams and goals? The thing I find most fascinating is the perfection in the imperfection. Most of the photos are not posed, they are just people living their lives. It is like being able to get a glimpse back in time that we will never know and meet people we never be able to actually meet. I think you can learn a lot from old photography. Sometimes the most interesting and beautiful photographs just happen. The important thing is to acknowledge the beauty of the moment. I would encourage everyone to take time and look through old photographs if you have any or go to an antique store and take a look. Just like strangers in your every day life, there is something you can learn from these people. Words do not have to be exchanged for one to learn. Take it all it in and at the very least you’ll get a small glimpse of history.